So, yeah, it's been a while. Call it the usual fall craziness, but throw in a good dose of bad internet connection too. It's hard to blog on dial up. We had another good studio tour again. 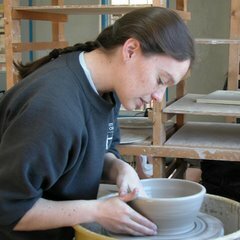 I've enjoyed having some time off from the pottery work this month. Especially since someone has decided to nap much less during the day. This was our Christmas card image. 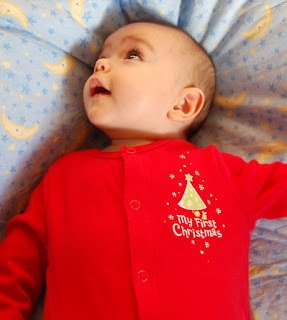 Thanks to his Aunt Elaine for the outfit. There has been lots of gift knitting which I couldn't show anyway. I won a bag of yarn (10 balls of Berroco Lavish) in a contest from Amy. It was not something I could imagine using myself, so I vowed to use it all up for a gift. 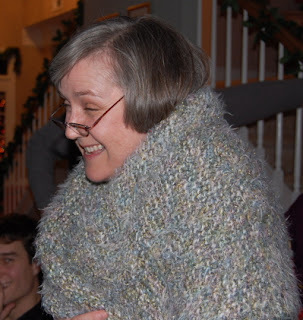 My aunt Patti won it in our gift exchange, and immediately perpetuated every stereotype about shawls. 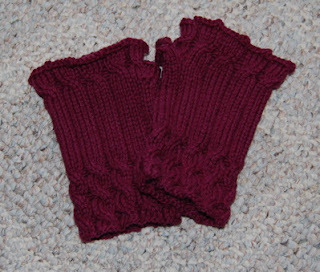 I also knit a pair of Fetching fingerless gloves for Kevin's niece. More of these to come. This pair is made from one ball of Debbie Bliss Cotton Angora. I'm working on several projects, one more gift with a deadline, a couple pairs of socks, and still my poor Rogue sweater that hasn't had a stitch added in at least 6 weeks. So hopefully after the last holiday knit is done, and the last celebration completed this weekend I can get in some more regular posts. the lavish looks snuggly! And like your aunt enjoys it! glad you were able to use it! Fetchings look great too! Happy New Year, Sarah! Nice looking knit projects. Oh my. 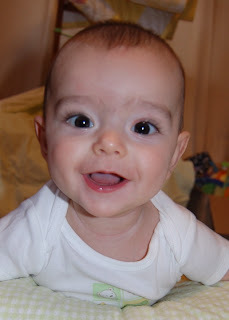 That is one cutie pie baby! I love the photos.